Originally posted on the CRUISE SHIP DRUMMER! blog in February 2017. I’ve been paying some visits to the Portland company Cymbal & Gong recently, and needing to write a full-fledged profile of the company. Until I get that done, here are brief reviews of a couple of cymbals I bought— it’s very hard to be around C&G’s products without buying them. 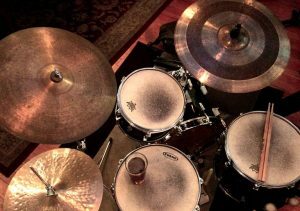 The company is run by Portland drummer Tim Ennis; working with a Turkish cymbalsmith, he has K-type and A-type cymbals manufactured to his specifications, and he applies a variety of patinas to them. Full details on his products coming soon. Holy Grail is the name of this line, and aptly so. I never thought I could get so excited by a 17″ crash. 1067 grams puts this in the thin category, with traditional, uneven lathing as you might see on an old A or K Zildjian. Patina is a very rich antique bronze— again, like an old K— with some green accents. And the cymbal plays like an old K. Have you ever played a 50-60 year old cymbal that has seen thousands of gigs? That’s the way this cymbal feels; by itself it seems slightly dead, with a slight funny twang. Played on the drumset with a band it sounds incredible; it’s a very responsive, fast crash, but it’s also a shockingly good ride cymbal, with great definition and no riding up. And it has a great bell sound. Jazz drummers today seem to feel anything smaller than 22″ is a joke, but this is a true bebop cymbal— the sound from all those 50s albums. Best cymbal I’ve ever owned. Cymbal & Gong seems to really excel at these crash cymbals, because we played a number of them at their headquarters (Tim’s house), and a number of them sounded great. Custom is not a line of product, it’s a catch-all name for short runs or one-offs to a variety of specifications. I would categorize mine as a light medium ride, which is lathed like an Istanbul Sultan or Bosphorus Antique— unlathed bell, unlathed band in the playing area, fully-lathed bottom. And it has a similar sound to those cymbals, which is difficult for me to define. The upshot is that it is a great-sounding K-type cymbal, which plenty of definition, that crashes beautifully, and has a really nice bell sound. This one has a beautiful hand-oiled finish that gives it a very deep bronze color; he had another similar 20″ with a matte green patina, which was rougher, more aggressive-sounding, and a beautiful honey-colored 19″ that was a little higher-sounding, very tight, and slightly more refined.